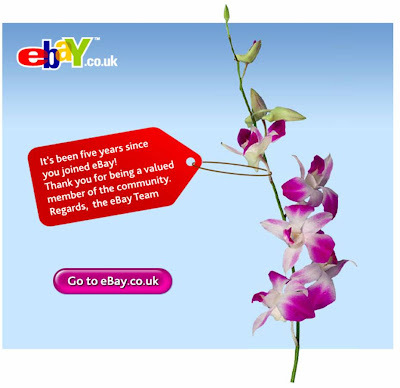 I got a nice email from Ebay today. Apparently I have been a member for 5 years and they sent an email to say "thank you for being a valued member of the community." Receiving a card like this makes you think about how much has happened in the last 5 years. It also makes you realise how much the internet has changed - 5 years ago there was no Facebook / YouTube / Myspace, itunes had just launched, there were less than 3 million broadband connections in the UK and people were worried for Google's future! I wonder if they'll send me a 10th anniversary card and what the internet will look like then?